This cute mini screwdrivers keyring is a superb novelty addition to a set of keys! It features three different tiny screwdrivers, two flat-head screwdrivers and one cross-head / Philips head screwdriver. The shafts are made of solid silver metal with solid plastic handles in red, green and yellow; just like a real screwdriver, only really small! 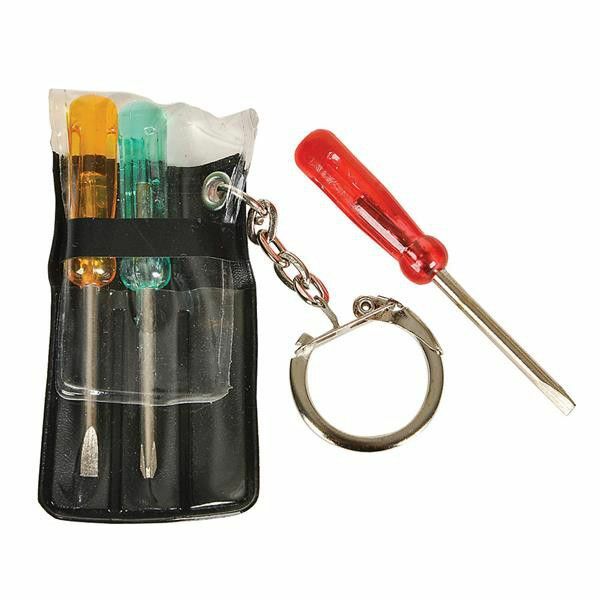 The mini tool set is presented inside a high-quality plastic pouch with a flap to secure the screwdrivers inside. As well as being a fun joke gift, this set can also be used practically for those fiddly jobs such as fixing watches or opening a battery compartment. A great gift for both kids and adults! Mini Screwdriver set measures 2.5 inches long and just over 1 inch wide. Made of solid metal and solid molded plastic. Colour: red, green and yellow handles, silver shafts, inside a black pouch with a clear cover.